Tucked under the tawny skirts of formidable foothills about 15kms/9.3 miles north of Cusco as the condor flies, via a narrow road and hairpin turns, the Sacred Valley holds its head high. The valley has long been the home of attractive colonial towns, isolated weaving villages, handicraft markets and lofty, 10th and 11th century Inca Citadels of Pisac,Ollantaytambo and Urubamba. Visiting the Maras Salt Mines and Moray terraces, which were made by building containment walls filled with fertile earth. They were watered through a complex irrigation system. At the base of the terraces, there is a rain water storage system. The entire system allowed for the cultivation of the Incas to grow over 250 types of vegetables. Then, we move on to the salt mines that consists that of 3,000 small pools roughly 5 square meters (53.8 ft²) in size. 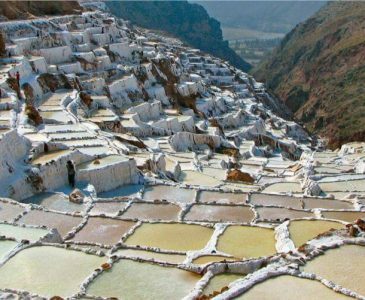 Every three days, during the dry season, workers fill the pools with salt water that comes from a natural hot spring at the top of the Maras’s complex. When the water evaporates from the pool, the salt is left for collection. This process is carried out over a one-month period until the pools reach an approximate volume of solid salt that is 10 centimeters (4 inches) in height. The salt is ground up, treated with iodine packaged and sent to various markets within the region. 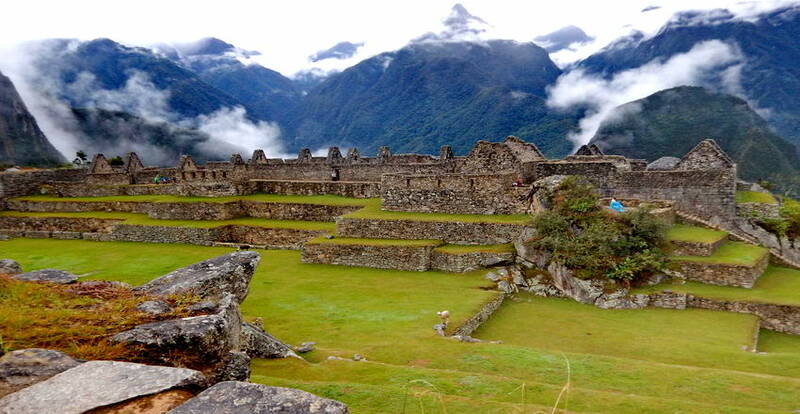 Explore amazing ruins and the fabled Lost Citadel of the Incas, Machu Picchu. The Inca Citadel of the Historic Sanctuary of Machu Picchu is the articulating center of its surroundings, a masterpiece of art, urbanism, architecture and engineering of the Inca Civilization. The working of the mountain, at the foot of the Huayna Picchu, is the exceptional result of integration with its environment, the result of a gigantic effort as if it were an extension of nature. 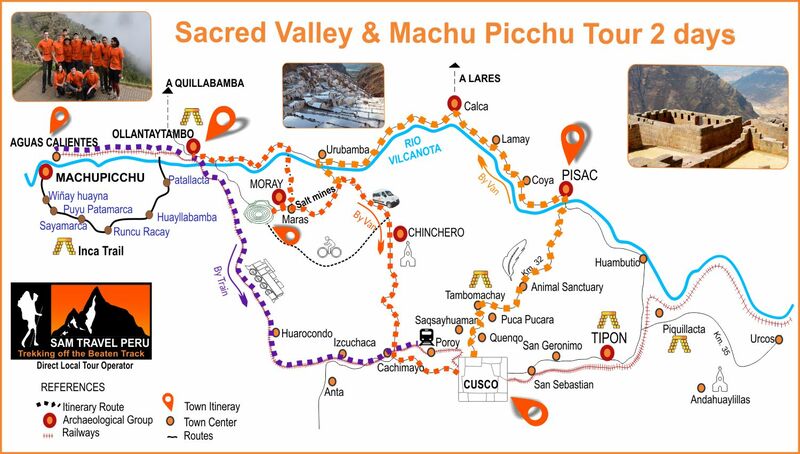 We will pick you up at your hotel at 7am, with our private van and head towards the Sacred Valley of the Incas, taking the direct route to Pisac. We drive first to the Ccochahuasi Animal Sanctuary, which has a variety of Peruvian animals including a Peruvian Puma, and the great Condor, the national bird of Peru. Then you are off to the mirador of Taray to enjoy a classic view of the Urubamba valley with crops dressing the mountains like a carpet. Onward, we drive to the archaeological site of Pisac, where you can see the biggest Inca cemetery with more than 2000 tombs. 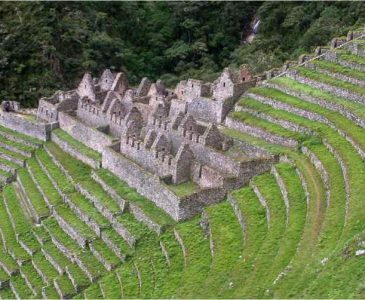 There we admire the incredible farming terraces carved into the mountain, explore the Inca tunnel and the religious area of this important citadel. Here we will spend more than 2 hours, exploring the Inca city. Then we head back to the colourful market of Pisac, spend some time visiting it with all of its handicrafts and treasures to discover and then drive to Urumbamba for lunch. Expanding on our journey to the colonial town of Maras, you ascend downhill to the pre-Inca salt mines. A hot spring at the top of the valley discharges a small stream of heavily salt laden water, which is diverted into saltpans and evaporated to produce a salt that is used for both human and animal consumption. Finally, we drive to Ollantaytambo, having time to explore the age old and bustling Inca village and the massive Inca Ruins, with a tour provided by our guide. 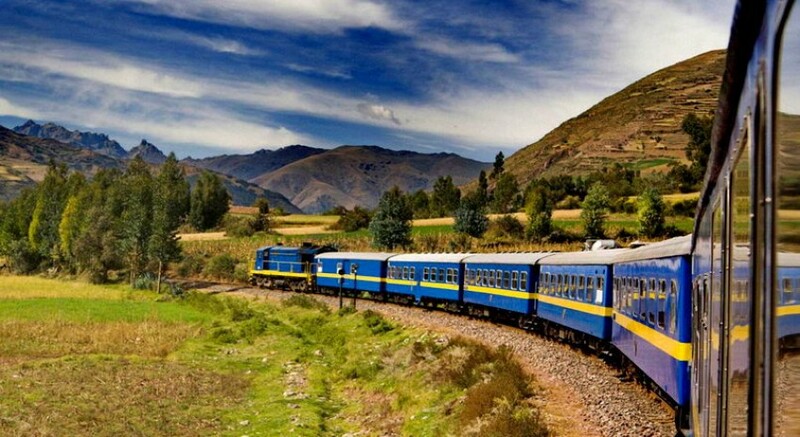 Then at 7pm, we will take the train to Aguas Calientes where we will spend the night in a hotel. Bursting out with excitement on your final surreal day, we take the 5.30am bus to Machu Picchu archeological site, arriving in time for the sunrise, making sure we tour every nook and cranny of this New 7 Wonder of the World and UNESCO World Cultural Heritage site. On your 2.5 hours private tour, your guide will expertly direct you through the energetic ruins and its diverse main streets. Then on your own, you can wander around the town squares of the world’s spiritual center of esoteric wisdom as well as climb the intricately carved stairways made of stone until the end of your session time. 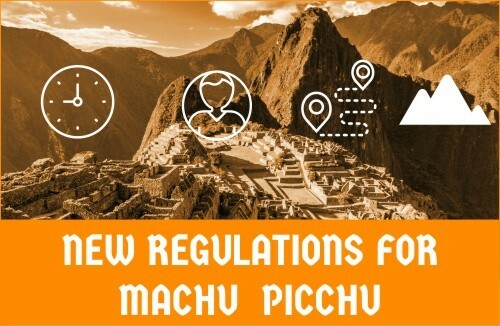 WHAT IS INCLUDED FOR THE SACRED VALLEY & MACHU PICCHU TOUR? 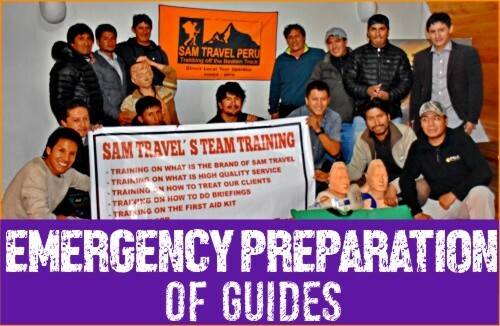 What is not included for the Sacred Valley & Machu Picchu Tour? Students with ISIC CARD: US$25. Please send us a copy of your ISIC at the time of booking. 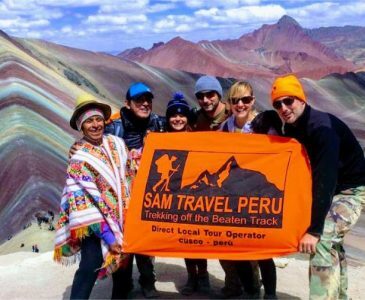 WHY CHOOSE SAM TRAVEL FOR THE SACRED VALLEY & MACHU PICCHU TOUR. For children from the age of 2 to 12 the discount is $60.